At ECOBAC we celebrate having a very good whale season, with a lot of work and many successes to share. 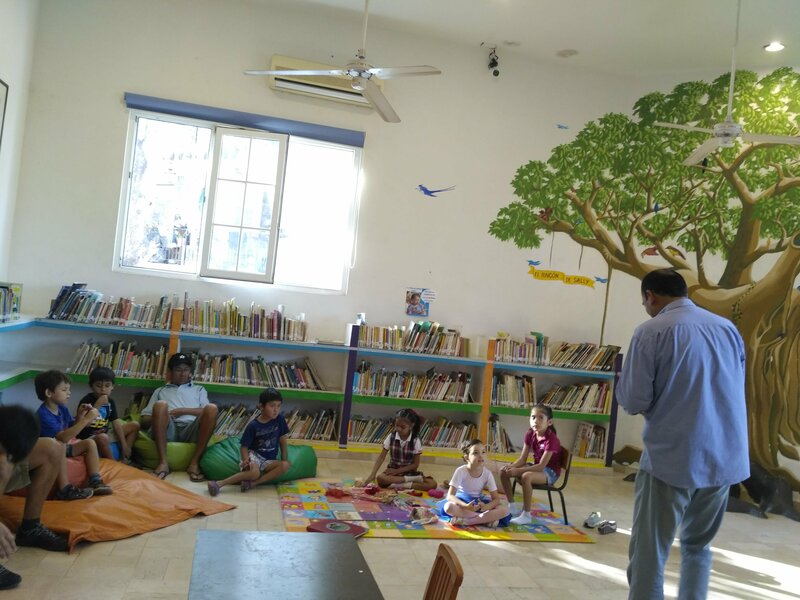 We apologize for the delay in sharing this newsletter, but we are short of funds and staff, nevertheless, we continue working with enthusiasm and passion. 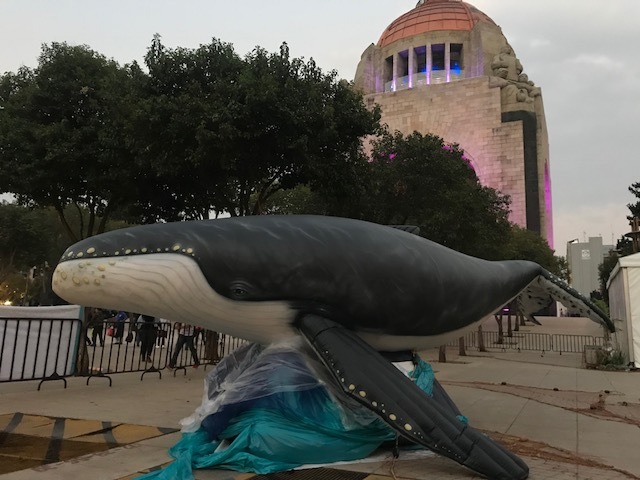 We´re also busy attending an International Whaling Commission Whale Entanglement Response Meeting and organizing the clean up of the stream Arroyo Seco. Thanks for your comprehension. We thank Thalia Martinez, for kindly translating our newsletter for our English speaking followers. This winter was a good year for whale watching. For the ECOBAC team, the 2017 – 2018 season was a hardworking and very and productive season, a large number of whales was recorded and with the great surprise of watching some whales defecating, which indicates that they were feeding here, which is very unusual, because as you may remember, this is not their area, nor feeding season. 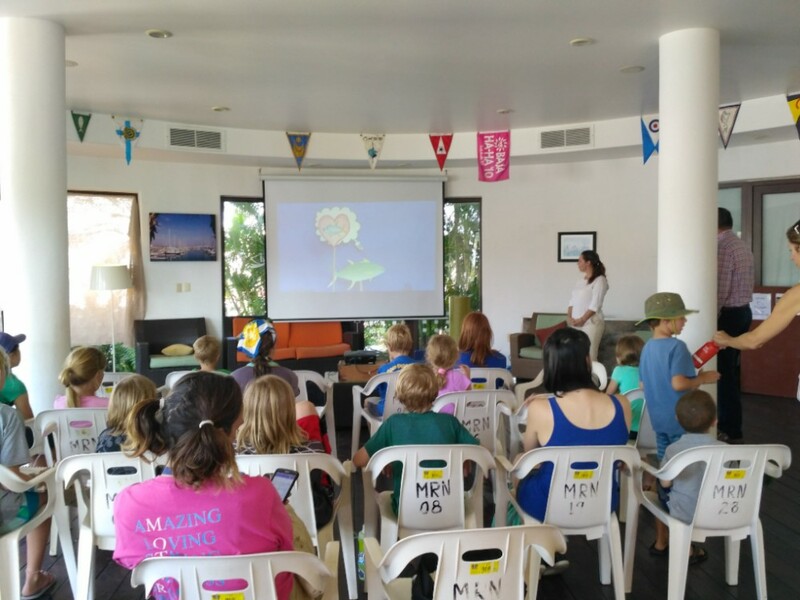 We also had some environmental education events to continue inviting the local population and tourists to help us taking care of our seas so that the whales keep coming back. 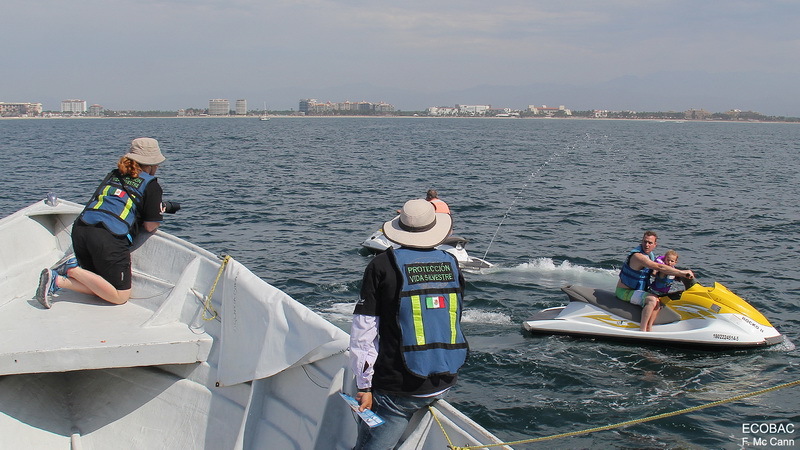 For the seventh consecutive year and thanks to the support of Opequimar Centro Marino, the Program for the Prevention, Information, Monitoring and Surveillance of Humpback Whales was carried out in Bahía de Banderas. This season we did not have funds for this program, but it was possible to make 7 trips thanks to the donations of Katie Lavery, Virginia Espino, Vallarta Natours and Ecotours of Mexico, as well as the continuous support of Frank Mc Cann and of course to the collaboration from the direction of the National Park Islas Marietas of the CONANP regarding the coordination of outings during the season. 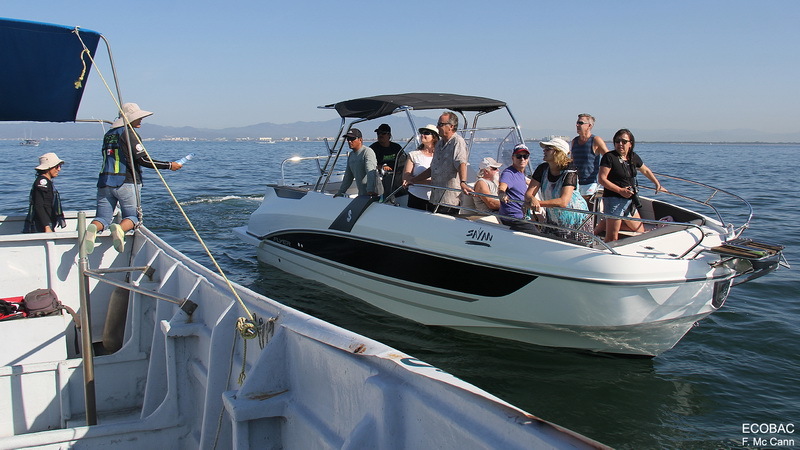 Just as other years, it was observed that 48% of the boats carrying out the whale watching activity did not have the corresponding authorization. This represents a big issue because those boats are the ones that incur in more faults. 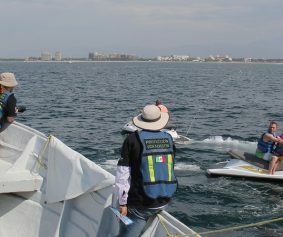 They are observed making sudden maneuvers in the vicinity of whales and harassing them, many are even recurrent, so that indicates that they are apparently performing an illegal tourism service. Another recurring problem this year were the jet skis. 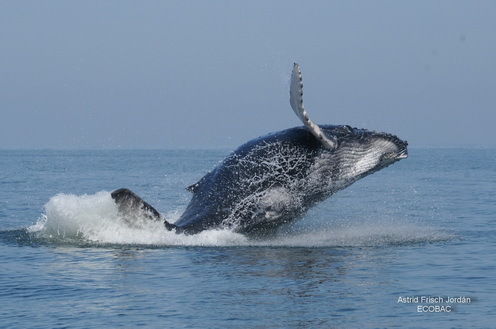 Many were observing whales far from the coast, putting at risk their lives and that of their companions, often underage. They would be bothering the whales through presence and sound, which has a sound wave frequency that alters the whales. That’s’ one of the reasons why it is prohibited by the Mexican Standard 131. 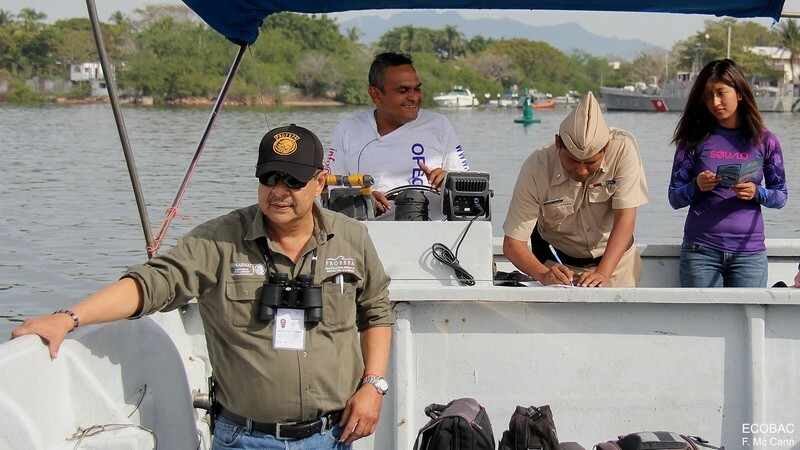 On the positive side, many vessels already recognize our work and inform us about those boats that are violating the rules. We also noticed that vessels tend to properly operate when we are out there. 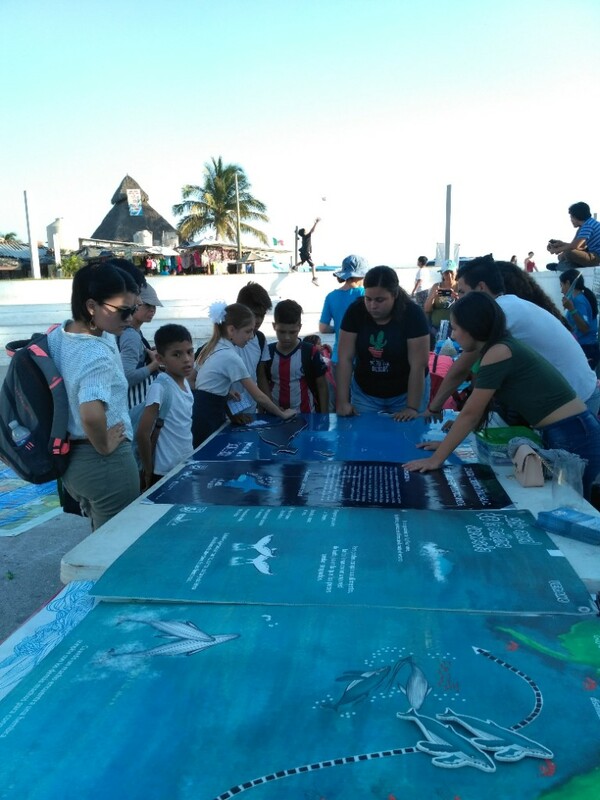 As our beloved Bahía de Banderas grows population wise, the problem changes, that is why it is necessary to continue with this program, ensuring that the bay continues to be a safe and an appropriate area for the breeding and reproduction season of the whales. 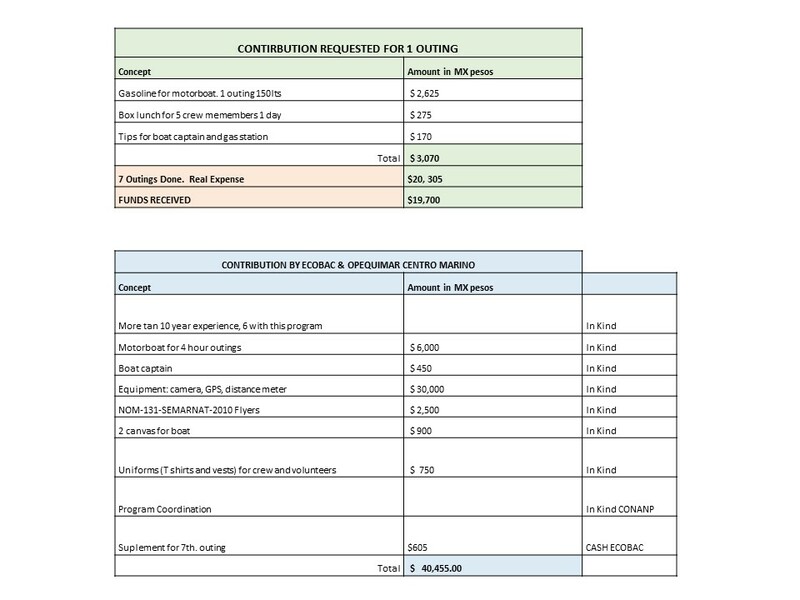 Below, we share the rough numbers of what we request to our donors, what we were able to collect and what was spent. The variation is due to the price and amount of fuel for the outings. The outings were achieved thanks to the collaboration of volunteers who accompanied us. We thank Frank Mc Cann, Ana Ezcurra, Iyari Espinoza, Isabel Morán, Fabiola Flores y Jorge Morales for their unconditional support. 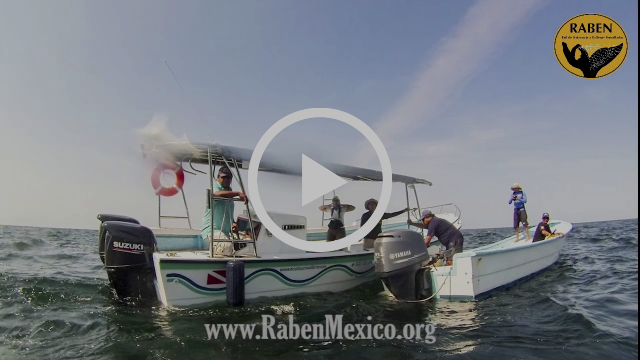 This season, thanks to the support of the whale watching fleet, we received a total of 9 reports of entangled whales, which is why the members of the Bahía de Banderas’ RABEN team (Network of Assistance to Entangled Whales) were in constant action during the season. We even had to attend reports and be out in the Bay on December 31 and January 1. 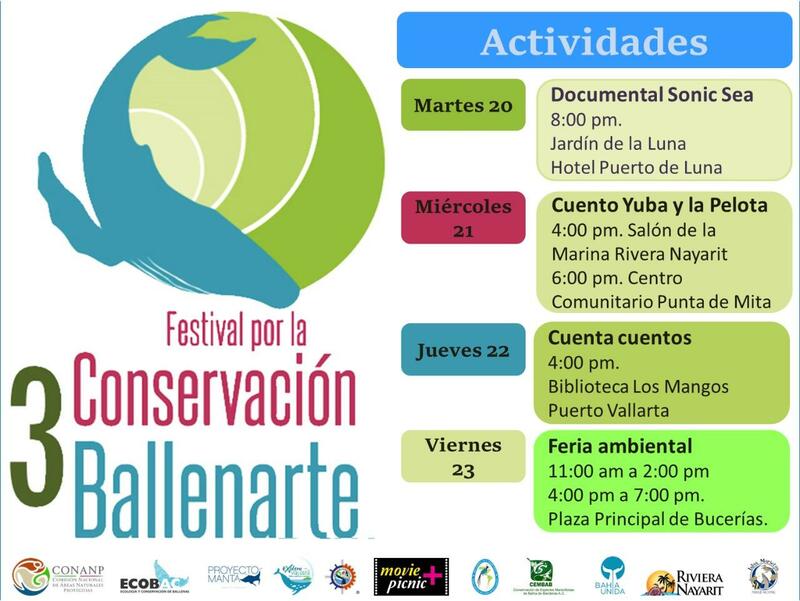 For the third time, we organized the BALLENARTE Conservation Festival, with four days of events in different locations in our beautiful Bay of Banderas. 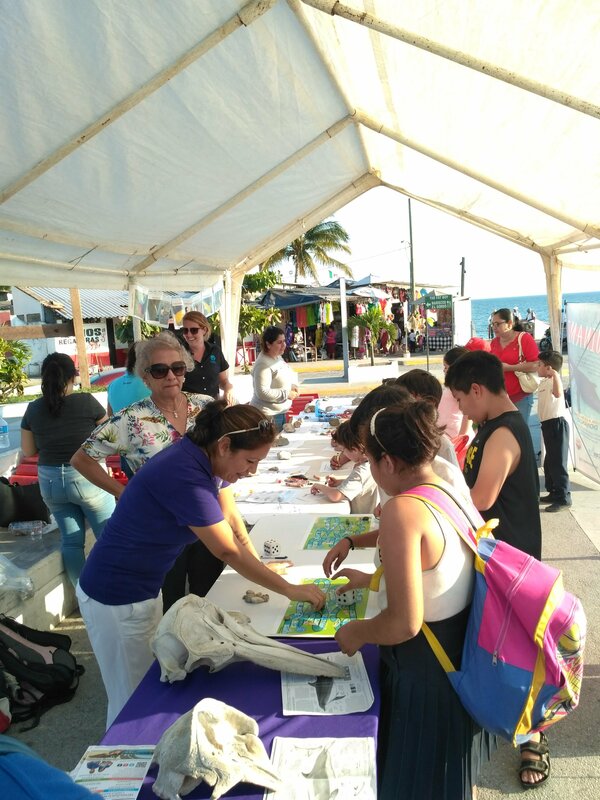 We thank Proyecto Manta, Explora Vallarta, Tecnológico Nacional de México, Campus Bahía de Banderas, Grupo de Investigación de Mamíferos Marinos, Bahía Unida, AC., Vallarta Natours, Pro Zona, AC., Dolphin Discovery, Ayuntamiento de Bahía de Banderas, Pronatura Noroeste, A.C. y Grupo Embotellador Nayar. for participating with activities and helping to make out of this fair a huge success. 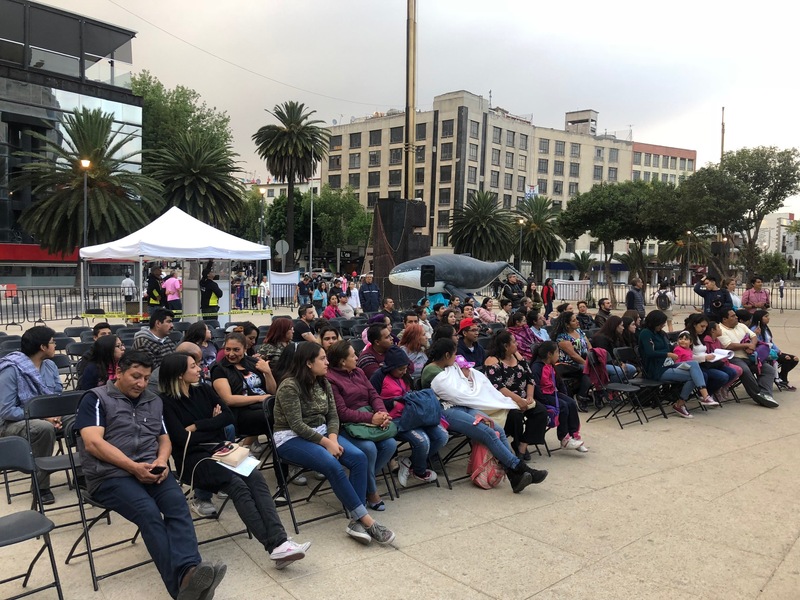 Special thanks to CONANP, in coordination with the Visitors and Convention Office of Riviera Nayarit, for their collaboration with us in the organization of the 3rd. Edition of BALLENARTE. Last but not least, a huge “thank you” to the team of volunteers who helped with the various activities: Thank you very much everyone!